Lithuania's synagogues, the vestiges of Jewish presence wiped out in Holocaust, are falling to ruin from lack of funding and support. Lithuania's wooden synagogues, the vestiges of a Jewish presence that was wiped out in the Holocaust, are falling into ruin from a lack of funding and support. Hidden behind a row of houses, the wooden synagogue in the eastern town of Alanta “looks more like a barn than a former house of worship,” according to a description provided by the AFP news agency. This rundown building, which served as a fertilizer warehouse during the days of state farms, is now used for storage by Algis Jakutonis, a farmer living next door. "I store my stuff there, and we still find traces of the Soviet era," said the 60-something Jakutonis, while displaying the large iron key to the former synagogue, which he acquired before Lithuania's independence in 1990. Prior to that, his homeland was officially atheist in line with policy across the Soviet Union which marginalized religion and saw synagogues, Russian Orthodox churches, Catholic churches, and mosques all used for storage or abandoned to ruin. But before World War II, Lithuania's vibrant Jewish community numbered around 200,000 people, 90 percent of whom were murdered by the Nazis or local collaborators between 1941 and 1944. "Jews owned around 20 shops here. After the war, nothing was left," said Danielius Drazdauskas, a 63-year-old carpenter born down the street from the dilapidating synagogue. "Why is a Lithuanian interested in Jewish heritage? It's simple: whatever the faith, it's my cultural heritage and I feel a duty to protect it," he said. Since independence, Drazdauskas has held local political posts and used them to plead the case of the synagogues both in the city and on a national level, according to AFP. Now, a national Jewish charity and the Jewish Community of Lithuania, the owner of the Alanta synagogue, are looking to restore it. "The restored synagogues could play an educational role, they are monuments to the memory of our community, once very important," Daumantas-Levas Todesas, head of the charity and member of the community's heritage commission, told AFP. Lithuania has 13 wooden synagogues today, according to estimates by Gilles Vuillard, a Lithuania-based French artist who has depicted them in his work since 2009. His paintings have been displayed several times in parliament and at the Vilna Gaon Jewish State Museum, devoted to Lithuanian Jewish history. heritage," he told the news agency. The first wooden synagogues appeared in Lithuania around the second half of the 17th century. "Wood was the cheapest material around," said Maria Rupeikiene, an architect and author of several papers on the Jewish heritage. The oldest synagogues still in existence were built in the late 19th century, the most recent in the 1920s and 30s. They were all returned to Lithuania's small post-war Jewish community following a 1992 law. 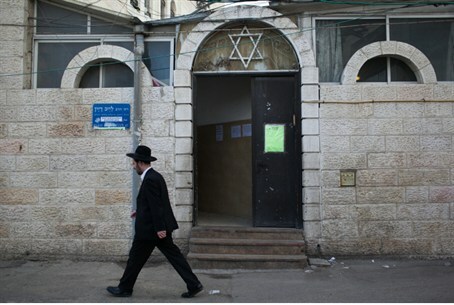 Today, a lack of funds and too few worshippers have caused the synagogues to close and look rundown. The oldest of the lot, in the northern city of Pakruojis, was damaged in a fire in 2009. "The most important thing is to preserve them. One option is to use them as libraries," said Faina Kukliansky, lawyer and interim president of the Jewish community. "Some municipalities have agreed to lease the synagogues for 99 years for their purposes, but it's difficult because the buildings are in a very bad state."